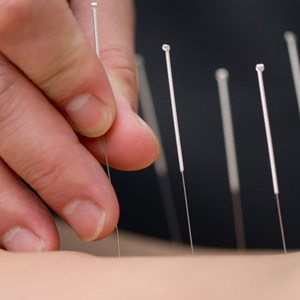 The ancient art of acupuncture is extremely beneficial in treating a variety of conditions. It is also credited with helping the body heal itself more quickly. The goal of acupuncture is to allow your “Chi,” your vital life force and healing energy, to flow more freely. Pain and illness are a result of the flow of chi in the body being blocked. Acupuncture can help “tap into” this healing energy in our bodies, stimulating freer flow and encouraging healing. Dr. Kris Huber has been helping patients with acupuncture since 1986. Many health conditions respond quickly and favorably with the combination of traditional chiropractic care and acupuncture. Dr. Kris has had success treating patients with “chemo-brain” and neuropathy. These are common side effects of chemotherapy treatments in cancer patients. Patients have seen their symptoms significantly improved or completely eliminated. Learn more about how Dr. Kris has helped patients through acupuncture. Take a look at some of our patient testimonials! “Lately, I had terrible pain in my hand due to arthritis. The mainstream medical community wanted to do a radical surgery with months in a cast and I knew my hand would never be the same. Fortunately, I thought of the doctors who had helped me so much in the past and made an appointment with Amesbarry. After one acupuncture treatment, the swelling and pain in my hand receded. I am currently going once a week getting both hands treated, they feel great! “I originally started coming to Dr. Kris at Amesbarry Chiropractic for bad lower back pain and now I have added “chemo brain” to that. I get an alignment about every 2 weeks; this keeps me walking and functioning with much less flare-ups. After getting chemotherapy most people are left with the side effect of it being difficult to think clearly and remember things. I now receive acupuncture on my face and head for my “chemo-brain” fogginess, this has been a Godsend! This completely clears the “fog” feeling from my head and allows me to think and work!